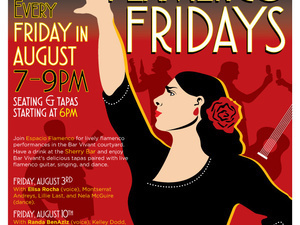 On Fridays in August, join Espacio Flamenco and Bar Vivant for lively flamenco performances in the courtyard. Each week will feature a different producer at the outdoor sherry bar. Get there early to grab some tapas and a sherry to pair with live flamenco guitar, singing and dance. Seating on a first-come first-served basis. All ages. Espacio Flamenco is a high energy flamenco performance group made up of local flamenco musicians, singers and dancers. Their goal is to create a space where flamenco arts and culture can be experienced, explored, learned and refined. They provide instruction, performance and special events that encourage individual expression as well as collaboration and exchange among artists.